Such is the reputation of Document and Eyewitness – an entry in Wire’s discography that has had as many vehement detractors as enthusiastic supporters. For those unfamiliar with Document and Eyewitness, it really doesn’t do the album justice to describe it simply as a collection of live recordings from three turn-of-the-80s Wire gigs. What makes it more than that is the unorthodox nature of the main performance and the way it was presented on record. The centrepiece of the original vinyl release was a recording of the final gig of Wire’s 70s phase (albeit one that took place in February 1980). This was a concert at the Electric Ballroom that grew out of the band’s performance art-based residency at the Jeannetta Cochrane Theatre the previous November. 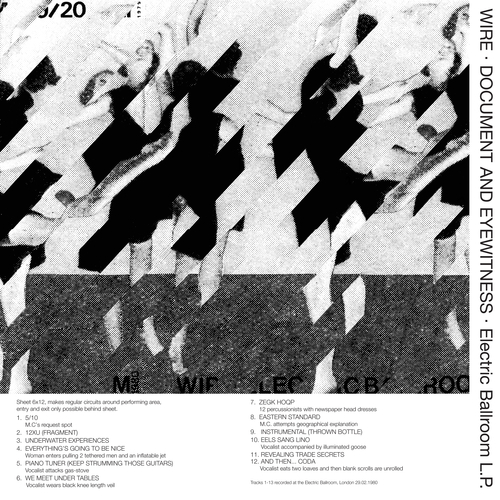 Delivering a traditional rock gig – or even fully realized songs, for that matter – was not a priority at the Electric Ballroom, and Wire’s set was composed of largely new (and often under-rehearsed) work, accompanied by a series of artistic actions and interventions. The annotated track list gave some indi- cation of the band’s broader approach to performance and entertainment on the night: this included such delights as an individual beating a gas cooker with a hammer, a woman pulling two bound men across the stage, an illuminated goose and massed percussionists sporting newspaper headdresses. One band member donned an exaggerated beekeeper’s veil, while others wore morris-dancing bells. Veering back and forth between the playful and the unsettling, this was a combination of performance art and absurdist farce, in more or less equal measure. The evening was memorable, above all, for the unusually hostile reaction from sections of the audience, which has perhaps elevated it beyond a simple passing moment. If the crowd was expecting a standard gig, the level of outrage, expressed in vociferous abuse – and with the odd thrown bottle – suggested that the band’s intentions were lost on those in attendance, who were instead confounded, bored and exasperated by the apparent artistic pretensions on display. What is beyond doubt is the fact that the documentation and presentation of the spectacle has lent an air of seriousness and intentionality to something that was considerably more about experimentation than deliberate career choice. A recording (marred by technical issues) was made for posterity, and by spring Newman, Lewis, Gilbert and Grey had begun to pursue their own projects beyond Wire. A year on from the Electric Ballroom gig, however, Rough Trade came to the band with a proposal to commit something of that night's events to vinyl. The approach was to couple selected live tracks with a spoken commentary on the proceedings by long-term Wire fans Adrian Garston and Russell Mills. Hence the title, Document and Eyewitness. For the album, the Electric Ballroom material was supplemented with recordings from a July 1979 show at the Notre Dame Hall (a straightforward band performance), along with one track ("Heartbeat") from a March 1979 gig in Montreux, during Wire’s stint as the support act on Roxy Music’s Manifesto tour. As Bruce Gilbert has often remarked, "Context is all," and it’s important to situate this material within a particular stage in the evolution of Wire. For many reasons, both good and bad, this period in Wire’s history became one of its defining moments, with the band paradoxically enjoying a phase of intense creative energy at the same time as it was dissolving – as if it had been dropped in acid. This release-cycle provides a wider view of the period, bringing in as much additional material as can be accommodated within the confines of the media. It takes as its core the Electric Ballroom, Notre Dame Hall and Montreux shows (remastered from the original tapes and pitch-corrected where necessary) and adds further texture with studio and rehearsal room recordings.